Although it’s not really new anymore, KFC‘s most recent addition to their admittedly paltry sandwich lineup is the Doublicious, which strikes me as kind of a do-over of their infamous Double Down. Even the name seems like a reference, especially because there isn’t much “double” about the sandwich (the website describes it as a mix of two flavors, sweet and savory, but that seems like a stretch to me). It works out though, because unlike the Double Down, the Doublicious is edible. It’s even delicious. It is a stupid name though. Every time I type it it looks wrong, because it makes no sense. A lot of what makes the Doublicious right has to do with what made the Double Down so wrong in the first place. As I said in that review, the Double Down has way too much meat and cheese, and without carbs to balance it out, it feels really heavy. The Doublicious wisely drops the novelty of the second chicken breast and some of the bacon and cheese, and sandwiches what’s left (chicken, a slice of cheese, two strips of bacon, and the sauce) between a Hawaiian sandwich bun. The bun really is what elevates this sandwich beyond the average. It’s sweet without being sugary, and it adds to the flavor in an interesting, but not overpowering way. I’m a fan of Hawaiian bread in general, and I think it would go great on a ham or pork sandwich as well (although obviously, this is outside of KFC’s purview). This sandwich takes the positive elements of the Double Down and gets the ratios right, which is what it needed all along. The Doublicious is one of the $5 meal options at KFC right now, which means you get a side and a drink with the sandwich. I’d highly recommend picking one of them up, it’s probably my favorite thing on their menu right now. KFC has a long way to go before they deserve forgiveness for the Double Down, but this is a step in the right direction. And now, because I love you guys, here’s a picture of Ken Jeong of NBC’s Community eating the Doublicious. "I tried to slow them down by talking about KFC's new Doublicious sandwich, but they accused me of doing product integration!!" Over the weekend, I had a couple different sandwiches in preparation for reviews this week, but something caught my attention, something which must be addressed: The KFC Double Down. I initially thought it to be an elaborate April Fool’s prank, but the actual photographic evidence online seems to indicate otherwise. 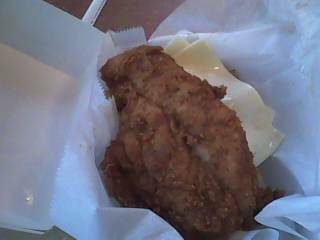 According to the website, the Double Down consists of bacon, Monterey Jack and pepper jack cheeses, and Colonel’s sauce sandwiched between two boneless chicken breasts. Yes, there is no bread in this sandwich. The End Times are upon us!!! First of all, any product which you must explicitly explain is not a parody is probably not the best idea. This concept has been used extensively in stand up acts and primetime comedy (30 Rock comes to mind), but to my knowledge this is the first honest-to-goodness real life example. To me, this seems like wretched excess, a travesty parading around in the trappings of a legitimate sandwich. Granted, I haven’t tried it yet. When the Double Down arrives (on April 12th, as all the advertising makes sure to tell us), I’ll be sure to give it a proper review. I only hope that this “sandwich” will be an odd little footnote in sandwich history, rather than a sign of things to come. KFC is an interesting brand. Originally Kentucky Fried Chicken until everyone decided fried food was a federal offense, KFC now offers grilled chicken in addition to its signature fried chicken. They also serve a variety of sides, generally with a more “home-style” feel. Their menu expansion over the past few years has allowed them add a couple sandwiches, namely the Honey BBQ and Snacker. Let’s begin with the Honey BBQ Chicken Sandwich. This sandwich was somewhat suprising. Generally, a barbeque chicken sandwich will consist of a chicken breast or other cut with some barbeque sauce on top. Wendy’s took this a little bit farther a while back by dipping the entire piece of chicken in barbeque sauce, but KFC puts them to shame. The Honey BBQ Chicken Sandwich is made up of somewhat shredded pieces of chicken mixed with a barbeque sauce, like a pulled pork sandwich. It’s an interesting idea, but it kind of falls down because the chicken has different levels of tenderness throughout. The Honey BBQ sauce was very good, not as sweet as I’d expected but still different enough to be noticable. A meal of this sandwich, potato wedges and a drink costs $4.99, not too bad of a deal for lunch. Objects in mirror may be smaller than they appear. Now for the Snacker. The Snacker follows an interesting and unfortunate trend in modern fast food, in which a chicken tender is wrapped in a little bit of bread (with some lettuce and possibly sauce added) and passed off as a legitimate sandwich. The rationale behind these sandwiches is that they’re just supposed to serve as a snack, to tide one over between meals. 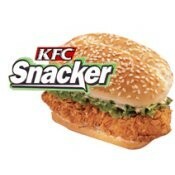 The Snacker has a nice piece of seasoned chicken, some lettuce and mayo (I believe), but it’s just not big enough to satisfy. It’s ordered best in groups of three or four, or to bolster an existing meal. At 99 cents, it’s not prohibitively expensive, but think of how far a dollar can get you in today’s fast food market. McDonald’s, Wendy’s and Burger King all certainly have bigger, more satisfying sandwiches available for the same price. All in all, KFC’s sandwiches are interesting little curiosities. If you’re there already, they’re cheap enough to try, but I wouldn’t recommend making a specific trip just to have them.